Some people come home from work and play with their kids. What do you do if you don’t have any kids? 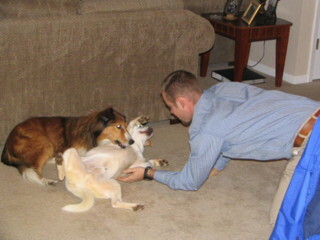 The dogs love to tussle with Jason. No one can get them as hyper as Jason can. They chase each other all around the house. 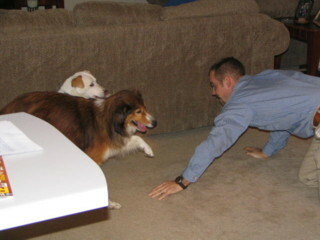 They get so excited that they sometimes can’t decide whether to chase Jason, each other or their own tails. They usually end up doing a combination of the three. 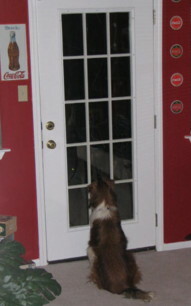 This is Mattie watching for Jason to come home. Victor had been sitting right beside her watching for Jason too, but she moved before I could get the picture. ~ by legmaker on January 6, 2008. Cute picture. That’s what I do when I come home to 3 Chihuahuas.